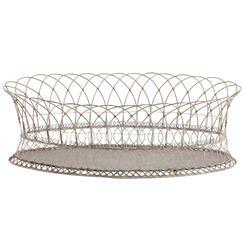 This long, oval weathered white basket looks like it was delivered from the French country market. This versatile piece looks lovely with baguettes or fruit on your dining table or filled with an herb garden on your porch. Yearly sealing is recommended to reduce rust in outdoor use.